Shake The Mountain are a female fronted hard Rock cover band hailing from the Steel City of Wollongong. Playing the best in rock from the 70’s 80’s 90’s and beyond, STM are sure to have you up dancing the night away and partying like its 1999 again! When STM hit the stage it’s party time. Audience participation is a huge part of the show. STM get the dance-floor rocking with material which is most appropriate from their comprehensive repertoire of Classic/Hard Rock. Expect to hear classic tracks from Guns n Roses, Led Zeppelin, ACDC, Wolfmother, Deep Purple and heaps more! Few bands hold a place in the hearts and souls of every true metal fan more than Iron Maiden. They are an icon; an enigma; an immovable force that has defined and refined the face of music in a career spanning over four decades. They are a musical institution that is beyond reproach and as such only the brave or foolhardy have ever dared to emulate the band by way of tribute. 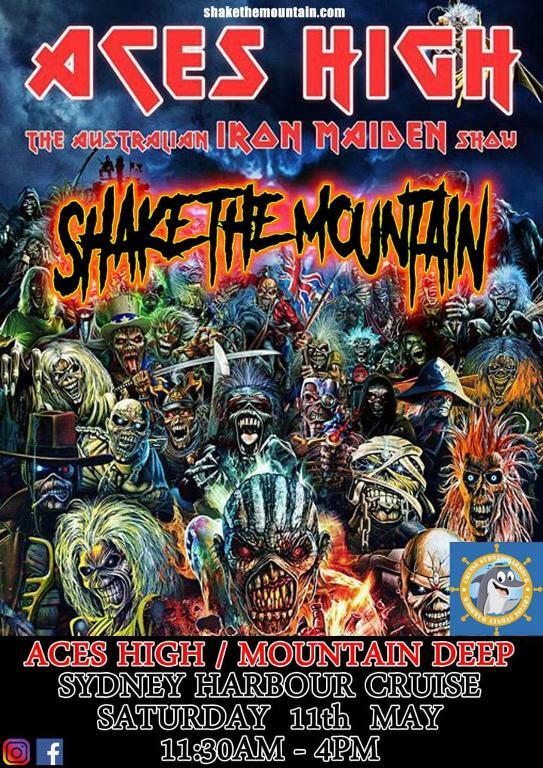 Aces High : Oz Iron Maiden Tribute Show, hailing from Sydney, are prepared to do just that. Pay tribute, homage, and respect to a band whose legacy is assured and whose feats will never be bettered. Covering almost every album from the self – titled debut through to current material, Sonja says the members’ passion for the music of Iron Maiden, as well as their individual skills, will see Aces High transcend the normally accepted parameters of a tribute show by not only performing the classics but also feeling them as well. With a 20 song set, including favourites ‘The Trooper’, ‘Fear of the Dark’, ‘Number of the Beast’ and ‘The Clairvoyant’, Sonja says that while the band attempts to please even the most die hard fans, she realises that coming up with a setlist to appease everyone is futile. The main factor that will stand Aces High apart from the rest is their choice of a female frontperson to fill the sizeable shoes of Bruce Dickenson. While admitting the gender change is sure to pique interest in a number of ways, Sonja argues that in themodern age of equality there is no reason why a female cannot perform the same vocal duties as a male.